About this Virtual Run: Join the Quest for the Golden Pearl by running or walking a 5k, 10k, or Half Marathon whenever and wherever you want. 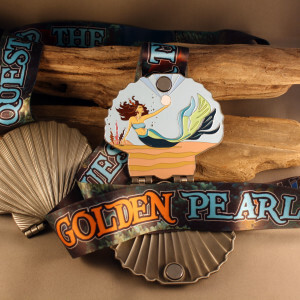 Not only will all registrants receive a personalized race bib and a stunning, four-inch, 3D, shell-shaped medal that opens/closes and features a mermaid scene on the inside, but 10 of the medals will include a special GOLDEN PEARL. If the mermaid in your medal is holding a GOLDEN PEARL, you will win a Virtual Strides medal hanger and TWO (2) free entries into the Virtual Strides virtual race of your choice, a value of more than $100! As always, medals will be shipped after you upload your results or at the end of the virtual race period, whichever comes first. Medals containing GOLDEN PEARLS will be randomly distributed to Quest for the Golden Pearl participants throughout the race period. For complete contest rules and details, please read the Official Rules. Found a Golden Pearl? Fill out the Golden Pearl Prize Claim Form by 11:59 p.m. EDT on September 30, 2015 in order to claim your prize! About the Charity: Did you know that 1 in 9 people lack access to safe water and that a child dies of a water-related disease every minute? For more than twenty years, Water.org has positively transformed millions of lives around the world by providing access to safe water and sanitation. Founded by Gary White and Matt Damon, Water.org pioneers innovative, sustainable solutions to the global water crisis, giving women hope, children health and communities a future. A portion of the proceeds from this virtual race (at least $5 from each registration) will be donated to Water.org. For more information about this organization or to make a direct contribution, please visit water.org.